Today’s comic is from a rather new strip that was started just about a year and a half ago. 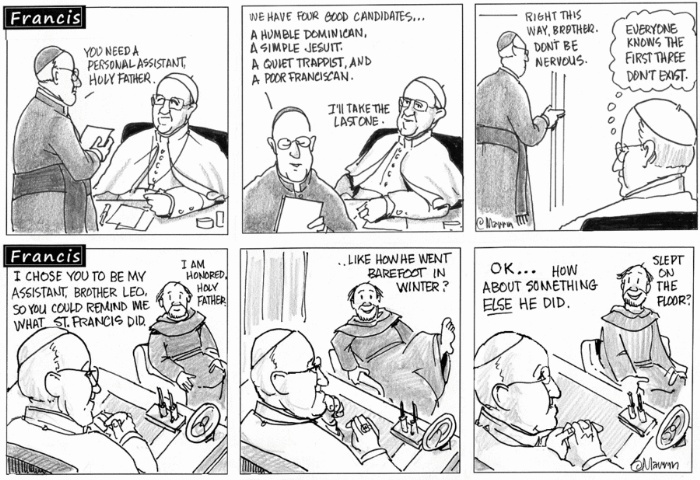 The strip is called Francis, from the National Catholic Reporter, and takes a light-hearted look at being the pope. Unfortunately, in later strips Brother Leo is always shown wearing sandals, which I’m afraid is what most Franciscans have gone to (for some unknown reason, to me). Many barefooters are aware of Simon Wikler’s book, “Take Off Your Shoes and Walk”, from 1961. You can even see a bit of it at the Parents for Barefoot Children site. You may not be aware that he had an even earlier book. On this snowy morning (at least in Ohio), how about a reminder of a summertime barefoot boyhood? 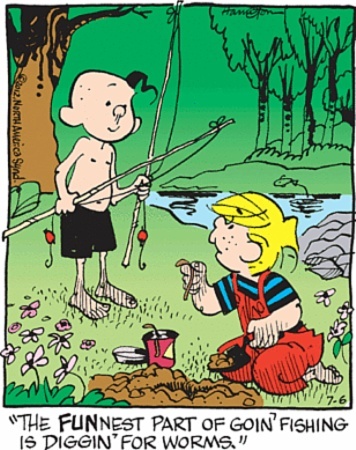 This is the Dennis the Menace from July 6, 2012. Lincoln is, of course, the quintessential barefoot boy made good. Folks these days make a big deal about his going barefoot, and make it a virtue. But then these days when many of us try to do it, it’s not seen as a virtue at all. Except it’s not. It’s really, really hard on them. We’ve been below zero quite a few times. Also, the snow buries a lot of their regular food. This time of year my bird feeder just doesn’t have enough slots to service all the customers. Why do so many stories regarding bare feet make so little sense. It’s as if their presence make people forget about logic. Our story today comes from Singapore.